A spent fuel accident at San Onofre Nuclear Waste Dump could cost a trillion dollars. Deal with it. Some people would be happy to leave San Onofre's 1,400 tons of accumulated radioactive spent fuel, from nearly half a century of leaky, unreliable, expensive and disquieting operation, right where it is. On an earthquake fault line, in a tsunami inundation zone, amongst 8.7 million of the most beautiful, industrious, peaceful and creative people in the world -- from all over the world -- who live within a 50 mile radius of the waste, and tens of millions more who live just slightly beyond that artificial marker. The highly radioactive used reactor cores will be stored locally in relatively flimsy (for their purpose) containers called dry casks. These casks -- about 40  are on site now, the oldest about 10 years old, with 100 or more yet to come to empty the spent fuel pools of fuel -- cannot resist significant forces of any sort (manmade, natural, you-name-it). Indeed, the casks are not even DESIGNED to withstand forces such as earthquakes greater than 7.0 (i.e., "The Big One" is not covered), or submersion in greater than 50 feet of water (i.e., any reasonably large tsunami), or boats crashing into them during the tsunami, or large jet airplane strikes (accidental or purposeful). Why aren't they built to withstand these things? Because they're considered temporary solutions to the waste problem. But these casks will sit here for decades, near major shipping lanes and under several commercial airline routes. The Nuclear Regulatory Commission optimistically suggests it might only be 60 years of storage but they plan for it to be several centuries. They might as well say it's forever. During that time, however long it is, the spent fuel will not be secured against terrorist attacks with satchel charges or rocket-propelled grenades -- or depleted-uranium spears dropped from balloons, for that matter. These containments just aren't that good. Rail accidents on the nearby tracks could cause massive explosions, as we've seen recently and horrifically in Canada. San Onofre's dry casks have some lead, a couple of inches of steel, and three to five feet of concrete. The main purpose is for shielding of gamma rays and protection from water vapor in the air (the casks are filled with inert gases to prevent any air getting in). And stacking the dry casks together as they are doing at SanO is also inappropriate. There needs to be more separation between each cask because in the event of an impact of any kind, they can all be pushed together and the cement crumbled, making a criticality event at least theoretically possible. If the impact is from a large jet, the burning jet fuel can ignite multiple casks. 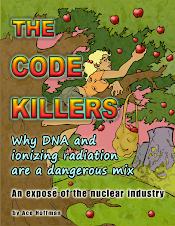 The entire San Onofre area is vulnerable to many natural and manmade hazards, but if the waste remains on site, any such disaster could also burden society with the additional problems of widespread radiation exposure, which would be much more devastating, for an immeasurably longer period of time. First, they are concerned about transportation accidents -- a reasonable fear. But consider this: Transport risks last for only a few days each trip, and there are a finite number of trips, because, thankfully, the reactors at San Onofre are permanently closed. So that's a relatively limited risk. On the other hand, leaving the waste to sit dangerously in an earthquake/tsunami/growing population zone is a danger that lasts for decades or centuries, and possibly forever. The other reason some people oppose transporting the waste away from San Onofre is that there's nowhere to put it. That is also a reasonable concern. Citizens, once alerted to the dangers spent fuel represents, invariably wise up and oppose both the transport of waste through their communities, and especially, becoming the "final destination" which will, inevitably, be called a temporary location. Nuclear waste is a tremendous liability to society. It always has been, and it always will be. All plans for long-term or "interim" storage have been stopped thus far -- not by "NIMBYism" so much as by common sense. No sane community wants the waste. 50 years ago the waste issue was recognized by many top scientists -- brilliant nuclear physicists -- as "intractable." The definition of "intractable" has not changed in the interim. Solutions have not been found. Shutting down all the reactors is the critical first step, since a closed reactor is no longer making MORE waste. However, at San Onofre, where that first step has recently been taken, some people refuse to even discuss removing the waste and instead, support the utility's plan for permanent on-site dry casks, pausing only to demand that those plans be implemented as quickly as possible, without considering any other alternatives. Frankly, SoCalEdison couldn't care less what we do with our waste. SCE is already authorized to walk away from the problem, maintaining just a few guards at ratepayer expense for eternity. SCE is also insured, and to top it off, their insurance is capped by federal policy at fractions of a penny on the dollar if anything goes wrong. So they have no reason to care. But dry casks -- especially the dry casks planned and currently used at San Onofre -- are inadequate. Fuel assemblies and even the fuel itself deteriorate over time from the heat and especially from the radiation. "High burn up" fuel, which San Onofre used for the last ten years, degrades its cladding especially quickly, making it much more fragile. This will significantly increase the risk if anyone tries to transport it later. As it deteriorates, high burn up fuel will also cause increased releases into the environment of radioactive noble gases and other radioactive isotopes including cesium, strontium and plutonium. Greater protection is theoretically possible -- but it's more expensive, and it requires moving the waste to a safer location that hasn't been found yet. However, that doesn't mean it shouldn't be done or can't be done. It just means it hasn't been done. New dry casks are popping up around the country at the rate of about one a week these days. As spent fuel pools fill up, that rate will increase to a steady-state (for 100 reactors) of about 4 to 6 dry casks per week around the nation. Each one, if its contents get out, could wipe out a small state. There are a total of about 75 sites in America with operating or closed nuclear reactors. Almost all have spent fuel stored on site. Most are under various airline routes. All are vulnerable to terrorism. San Onofre has repeatedly been cited as a likely terrorist target by elected officials because of the devastating damage an attack could do to the economy and lives of so many millions of people. Have the lessons of 9-11 truly been forgotten just 12 years later? The time to solve the nuclear waste problem is now, not later. Once the waste has "cooled" enough to remove it from the pools, it is still incredibly hot (as much as 400 degrees Fahrenheit at the fuel rod's surfaces) and stays hot for many years. The heat is produced mainly by the decay of fission products, emitting deadly gamma rays (hence the lead, steel, and cement shielding) as well as alpha and beta particles. The spent nuclear fuel is in danger of fire by several methods, including, of all things, water intrusion, which can lead to zirconium cladding degradation along with splitting the water molecules into separate hydrogen and oxygen atoms. This chemical reaction created an explosive atmosphere three times at Fukushima, and is known to have happened in at least one dry cask here in the states -- but it was discovered before an explosion occurred. Will we always be so lucky? As the fission products decay, the spent fuel cools and becomes "safer." However, it doesn't become "safe" ever. Many of the most dangerous isotopes, such as cesium and strontium, have half-lives in the 30 year range, and are at their peak now. Thus, the importance of taking care of the "spent fuel problem" is highest now -- much higher than, say, 30 years from now when about half the cesium and strontium will have decayed. So waiting makes no sense. The waste's most virulent components are at their peak quantities right now, and an accident now would be the most devastating for the planet's collective DNA -- DNA which has already taken a terrible hit from weapons testing and use, from Chernobyl, from Fukushima, from 1000 other accidents and purposeful spills, and from continuing leaks at Hanford and other nuclear sites. 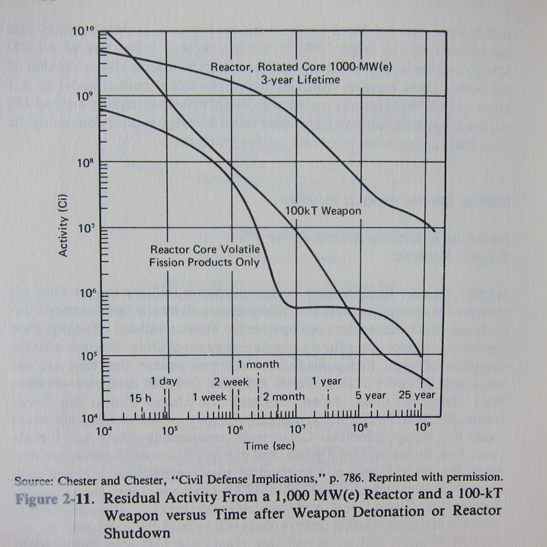 There is really only one logical conclusion, of course: It's time to shutdown the reactors everywhere. In China, Russia, France, England, India, South Korea, and everywhere else, not just in southern California. Currently nuclear waste is stored in at least four locations in California. Those four sites need to be consolidated into one highly protected site, with earthen berms between EACH cask, and a "no-fly" zone and other considerations. But how will consolidation be accomplished when communities are bullied into supporting flimsy, inadequate dry cask storage wherever the waste was produced, regardless of the danger? Activists in Humboldt County and around Rancho Seco have accepted dry cask storage for years. Why shouldn't southern California? The answer is, because southern Californians understand, post-Fukushima, what the real dangers of spent fuel are. For all intents and purposes Fukushima was a spent fuel accident. While it's true that the reactors tripped after the earthquake and had only been shut off for a short while when the tsunami struck, it's also true that even if the reactors had been off for years, the same basic sequence of events could have happened if water wasn't circulated properly around the used fuel assemblies. Spent fuel is incredibly deadly stuff, but in fact, Fukushima was not a "worst case scenario" by any means. An even larger catastrophe is still possible at Fukushima because of the fuel that's still there in the spent fuel pools and dry casks, and because the melted blobs of "corium" (uranium and plutonium) can theoretically go critical again. Massive explosions of the corium blobs are also possible without a new criticality event, when/if they reach the local water table. And more than two years after the meltdowns, nobody knows precisely where the corium blobs are. There are 23 reactors similar to Fukushima's operating in America, and all other types of reactors have other dangers which make them just as capable of catastrophic accidents as those were, but in different ways. 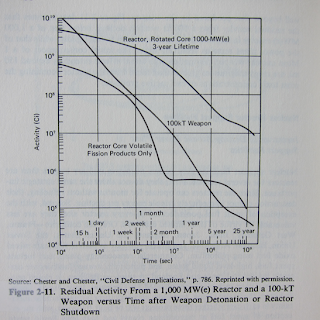 There are no "safe" reactors, and there is no safe way to store or transport the fuel. If America chooses not to wake up to this reality, sooner or later it will cost us dearly: A spent fuel accident at San Onofre Nuclear Waste Dump could cost a trillion dollars. The spent fuel will need to be guarded for hundreds of millennia, but right now it is MOST important that it be guarded properly. Whatever the "interim" storage solution is -- wherever it is -- needs to be thought of as "permanent" since it will inevitably be expected to last for hundreds of years. The current, totally ludicrous plan is that, while the fuel is the most dangerous by several orders of magnitude, we plan to store it in the cheapest "temporary" containment system of all. Then we plan to transport it after its fuel cladding and structures have all degraded and are far more likely to cause problems and radiation releases during shipment. THEN we plan to finally move it! Our current national nuclear spent fuel policy will inevitably result in catastrophic dry cask accidents somewhere -- perhaps near large population centers. Shutting down ALL the reactors now, and properly securing ALL the waste immediately, is the only logical thing to do.